In meeting one of our most basic needs  hunger  we have opened a Pandora's box of complications. We successfully produce enough food to feed us all, but we have to treat our livestock with antibiotics to keep them healthy and spray our crops with pesticides so they survive till harvest. We feel compelled to add vitamins and supplements to food to eradicate disease and boost nutrition. Through the confusion, a word emerges that seems to resolve all the unwanted side effects of food production: organic. But the cost of going organic can be high  and it can be more than merely financial. Humans are designed to use and digest foods that look the way they did when they came from the ground or were cooked fresh from an animal. No matter how much technology or genetic modification led to what's on your plate, your digestive system is pretty much the same as it was when our ancestors climbed down from the trees. So the smallest amount of industrial additives must be best, right? Maybe not. Since our caveman days, we've learned a lot about how to protect crops and keep our animals healthy, how to farm fish and add vitamins to food to eliminate deficiencies. These are admirable achievements that stem from noble motives; as a physician, I would argue there is no higher ideal than to use food as medicine. Consider three food additives that changed the natural history of certain ailments that have plagued humankind: folic-acid supplements help prevent neural-tube defects and certain childhood cancers, increased omega-3 fatty acids boost brain development and may increase intelligence, and vitamin D and calcium in dairy products reduce the incidence of rickets. We shouldn't be indiscriminate, but a few well-selected additives can do a lot of good. Still, introducing modern chemicals into the food chain has raised concerns as well. Hormones given to livestock to spur growth are troublesome enough to warrant the extra cost of a label declaring which meat products are hormone-free. Paying a bit extra for hormone-free meat may be a case in which spending a little more makes sense. Otherwise, read as much as possible about the various hormones used in animals, since not all of them affect us the same way. A major advantage of modern food manufacturing is the relative absence of food-borne illnesses. Yes, there are still outbreaks of E. coli that sicken or kill people and prompt huge recalls, but we rarely think about the elaborate premarket safety measures that prevent such gastronomic perils from being much more common. Even a proponent of locally grown organic food like me accepts that if it makes it to your table with no safety supervision, you're at risk of getting sick. Sometimes the consumer has to take independent action to avoid food-borne pathogens such as E. coli and salmonella. Always wash your hands before preparing food and anytime you switch between handling raw meats and produce. And wash once more when you're done. Wash cutting boards and utensils thoroughly  again, especially between uses for meats and for vegetables. Cook food thoroughly  at least until the center of any dish is over 145°F (and even higher for certain meats and poultry), as measured with a food thermometer. And avoid thawing and refreezing food, as this can increase contamination risk.  Choose foods without labels, which are better than packaged foods.  Wash fruits and vegetables thoroughly, preferably with a vegetable brush, which can enhance pesticide removal. 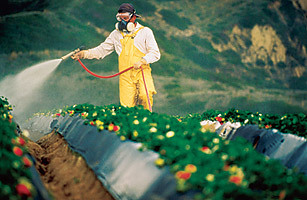 Some foods absorb more pesticides than others and are easier to clean. The top five common items that I recommend always be washed are peaches, apples, sweet bell peppers, celery and nectarines.  Peel fruit if possible since that removes pesticides and allows you to save money by buying nonorganic.  Buy seasonal fruits. It lowers your grocery bill. And bear in mind, frozen veggies retain most of the health benefits of fresh ones. Most important, remember: Caveat emptor, or buyer beware. When it comes to food, buy organic if you can afford it to help the planet. If not, you can still eat healthily with a few precautions. Food is an affordable medicine for all of us. See "The Battle for Global Health."